Yarn substitution: we all do it. Whether we're doggedly working through our stash, or can't wait to find some pattern that suits the yarn we love, or simply can't afford to use a pattern's recommended yarn - you price out a small cardi and come up with $250 in materials, you're going to think twice - knitters quickly outgrow the idea that they have to use the yarn the pattern says to use. Plus, part of the point of knitting is to put your own stamp on a thing. But every yarn has its own qualities, and designers take those into consideration when they pair one with their idea. So: if you stray too far from that tree, you are going to come up with an entirely different sort of walnut. Even one that may look suspiciously like a frog. Size matters here. Even if you have the correct gauge, you can still run into trouble: for example, a slim yarn knit on big needles might give you the same gauge as a moderately sized yarn and matching needle, but the end product will have a lot more drape. Or a lot less, if you match heavy yarn with tiny needles. Where a piece is meant to be soft and supple, you could find you are wearing a cardboard box. But the biggest fact to consider is fiber. There are an incredible variety of fibers spun into yarn for knitting, and they all have their own qualities. See: Knitter's Book of Yarn, and Knitter's Book of Wool for much more exhaustive explorations on this point. Here's a quick surface-skimming of the features of the most popular choices, with an emphasis on elasticity, hereafter to be referred to as 'Sproing'. All yarns are assumed to have been spun equally since some yarns are spun for maximum sproing, and others have hardly been spun at all. If in doubt, pull gently on a strand of the yarn you are considering, and then on several other yarns, to get a sense of how much they stretch out from their resting state. Wool has a sproing factor of 'huge', and will bounce back immediately after you stretch it out. You can make a hat out of wool that looks way too small when it's lying on a table, but when you put it on it will expand to accommodate a much larger noggin and then settle back down to small when you take it off a few hours later. Superwash wool has a slightly lower level of sproing, in my experience. It has been treated to remove all the little grabby bits on the sides of each strand of fiber, so it won't felt as easily if you throw it in the washing machine. Without the grabby bits, it will be softer too, so it's a win-win! Except that some superwash wools - not all - stretch out irretrievably when you wash them. I still haven't figured out why, but I do know that the weight of the finished project affects the degree of stretch such that even a gauge swatch dutifully washed and dried won't give you the full picture. It's not a bad idea to use a new-to-you superwash for something like a scarf or shawl before you move on to something that has to fit. A lot of knitters substitute acrylic yarns for wool-based patterns: they wash well, and they almost never itch, and they are super affordable; you don't even need to have access to a yarn store to get them, because they're usually what's stocked in your local discount department store. As a bonus, they are often spun to look like wool and sort of act like it, with a friendly sproinginess that makes them comfy to knit with. But they are only pretending: they won't stretch or spring back or do any of those other nice things that wool will do, and they will never, ever sag out like some of the fibers lower down on this list. You have to take that into serious consideration when you substitute acrylic for one of those, especially. Alpaca has very little sproing. Instead it's all about soft and heavy and also, absorbing insane amounts of precipitation to protect you from getting wet yourself. (also it grabs onto other strands of itself like nobody's business, so if you are likely to make mistakes and need to rip out, you will be a very very sad knitter.) Wools blended with alpaca will still have some sproing, but not as much as they would have if the alpaca wasn't there making it all relaxed and protective. If that's what the designer had in mind, then you'd better think about it too or you will have a much less drapey hat than the one you fell in love with on paper. If you ask silk about sproing, it will look both perplexed and apologetic and tell you Sorry, I don't speak that language. Silk is luxurious and shiny and drapey and has no tension in it at all. Like alpaca, it will accept the sproing factor of whatever it's blended with, even as it leads that fiber into a peaceful water garden to calm it down already. But silk takes things a bit farther: it actually grows when washed. And that can be a nasty surprise when you thought you had a handle on your gauge. In fact, somebody who got burned by this fact commented on my Luxury Lid pattern that my stitch count had to be a misprint because what was meant to be her adult-sized version of it didn't fit a child. Well: it was correct - but only for a yarn with the right amount of silk in it. Cotton doesn't speak Sproing either, and it too will sag out over time. I knit the most beautiful white cotton sweater as a teen that I wore every summer for years - oh how I loved that thing. It did eventually lose its shape but not too badly because it had an elaborate moss stitch pattern all over that distracted the fiber from doing anything too drastic. The other day when I was in a yarn store hunting for the colours and fibers that would get me closest to a hat I had been dreaming about, the reality of yarn substitution hit home big time. 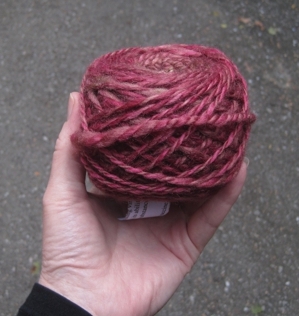 I wanted a sport weight, soft, 100% wool yarn with sproing and a clean finish, in very specific colours, in a yarn that other people could get their hands on if they wanted not to substitute. That last point meant choosing a yarn from a major yarn company with a huge distribution, at a price that was not just downright silly. And you know what? There was no such yarn. I spent over an hour in Romni Wools, which has a huge, huge inventory, and in the end the best solution was to check off every other box and accept a slightly heavier weight than I wanted, and at a higher price. In the end, it's only a hat, and hats don't need a whole lot of yardage: maybe some people who knit this pattern won't mind paying a premium to use the same yarn I did. But if they do, all they have to look for is a simple, 100% wool DK yarn in their stash or at their local yarn store. So: even the people who are making patterns struggle with yarn substitution. Thank you so much for this post! I have only ever made scarves and blankets in various yarns, and I am now making my first pattern, ever, that requires shaping. It's a little romper for my friend's first baby and I'm using cotton. The lack of sproing totally makes sense to me now that I've finished one half of the romper (lightbulb!). You are so welcome Christina - and good luck with that romper, it'll be so cute on a tiny baby! Such good info! I'd add to acrylic: don't ever try to iron it or throw it into the dryer. It acts like what it is--plastic--and melts and droops and does other weird stuff. Do not ask me how I know this. Oh yikes Karen, yes: acrylic, ever so melty!! This whole article was a huge help to me! I now understand why my projects don't work well, as I'm one of those people who like to substitute yarns (in the same way I play about with cooking recipes) and then wonders why it didn't turn out quite like I'd want it to! Although once it turned out better, so that was a bit of happiness. Anyway, I laughed all through your article, because it's so humorously well-written!!! Thank you so much for a few minutes of complete tears-in-the-eyes gasping laughter!! !